Top of the range receiver with integrated radio remote functionality, digital readout, millimetre accuracy and strobe rejection. Automatically align your laser plane at the touch of a button – horizontal, vertical and dual axis. Smart Technology Smart Target - Automatic slope catching and monitoring with radio communication for slope, façade, batter board applications and more. Digital Readout The large numbers are clear and easy to read, so you can stay on grade. 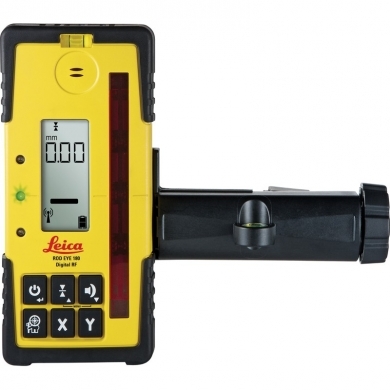 The 21 step arrow displays provide a graduated reference as you lock on the laser beam. Capture Function The capture button allows the user to store and display a measurement. Audio Indication Four audio settings. Up to 110 decibels for noisy jobs. Units of Measure Digital information is displayed above and below grade in mm, cm, inches, fractions of inches and feet. Versatile Rod Bracket An optional rugged rod clamp ensures solid mounting to the grade rod. The circular level vial aids to keep your grade rod plumb.